The new DCP station is to be located at Arminou at 34°52'N and 330°44'E and has the WMO number of 17603. This DCP station is located on a similar catchment as the DCP station of Panayia Bridge which is at 35°01'N and 33°05'E and which has the WMO number of 17605. The new DCP station is on the wind-side of the Troodos mountain range towards the southwest where there is more rainfall and higher flows. The new site is called Arminou and it is on the Dhiarizos River that is the second, in terms of flow, river in Cyprus. At this site a diversion dam (4.5 million m3 capacity) is expected to be completed by the end of 1998. Some 20 million m3 is expected to be diverted from this river annually to another reservoir some 14 km away, the Kouris dam. The Arminou site is rather remote (2 hours drive from the office) and large water level fluctuations are expected in the reservoir due to the inflow and diversion. Real time data will be required for the successful operation of the diversion. The DCP is expected to measure the water level in the reservoir which at the same time will be providing the spills, if any, on the basis of the hydraulic characteristics of the spillway. The diversion towards Kouris reservoir and all other releases through another outlet will be monitored through the use of two "MagMaster electromagnetic flow-meters" the read-out units of which will be located next to the DCP. These flow-meters will also be monitored by the DCP and real time data on the diversion and other releases will be transmitted concurrently. In addition the new DCP will hopefully record a) water temperature in the reservoir (at surface and at depth); b) wind velocity; c) wind direction; d) solar radiation; e) humidity, and f) atmospheric pressure. These measurements will allow the evaluation of evaporation from the lake that will also be compared with the class A pan evaporimeter. Knowing the water level in the reservoir, which will also allow the evaluation of the spills, if any, and the quantities diverted through the two outlets, will provide a complete monitoring of the inflow and the operation of the reservoir. This application of the DCP will be of great interest to us and should as well be to the Med-Hycos. Details of the Arminou reservoir which will be completely monitored by the new DCP station are given in the attached Table 1 whilst monthly observed flows for the Dhiarizos river at this site as well as monthly rainfall are given in Table 2. Photographs of the Arminou reservoir taken on the 26th of October, 1998 are shown on Figure 1 and 2 . The construction of the dam is expected to be completed within one month although it can be operated and allow diversion and releases as of now. The Arminou reservoir and the diversion from it towards the Kouris reservoir through a 14.5 km tunnel are the last part of a major project to be completed. This project is the Southern Conveyor Project that is described in the text that follows. The need for real-time data on the water flows and content of this reservoir are due to the commitment that diversion to the Kouris dam can only be implemented once local needs are satisfied. This means that releases should be made first at an agreed quantity for the recharge of the downstream riverbed aquifer, these being based on the flow of the river and the conditions in the aquifer. The operation of this reservoir depends thus on the day to day water balance in it and the flow of the river. The Southern Conveyor Project is the largest water development project carried out by the Government of Cyprus. The basic objective of the project is to collect and store surplus water flowing to the sea and convey it to areas of demand for both domestic water supply and irrigation. Phase I started in 1984 and included the construction of Kouris dam on Kouris river, with a capacity of 115 million cubic meters. In addition it included, the main conveyor which is a 110 km- long pipeline, the Akhna terminal reservoir of a capacity of 5.8 mil. cu.m. and the system for telemetry. The irrigated area involves the Kokkinochoria and other irrigation schemes of a total area of about 9767 hectares. This phase was completed in 1994 at a total cost of US $200 million. 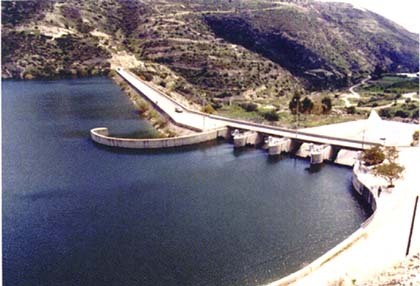 Phase II includes the Dhiarizos diversion controlled by the Arminou dam, conveying water from the Dhiarizos River to the Kouris dam through a 14,5 km tunnel. In addition, it includes the Limassol and Tersephanou water treatment plants (80000 and 90000 m3/d capacity respectively); the Tersephanou-Nicosia conveyor, a 36,5 km long pipeline; the water supply to villages west of Limassol and the Akrotiri, Parekklisha - Mazotos and Kiti irrigation schemes of a total area of about 3895 hectares. All these except the irrigation schemes at Parekklisha - Mazotos and Kiti have been completed at an approximate cost of US $120 million. The location of the DCP stations 17603, 17605 and the proposed one at Germasogeia with number 17604 are shown on the map. On the same map the major water development works in the island are also shown. Construction George P. Zachariades Ltd. The 3rd DCP station is proposed to be located at Germasogeia at 34°45'N and 33°05'E and carries the WMO number 17604. This DCP station is located on a similar catchment as the DCP stations of Panagia Bridge at 35°01'N and 33°05'E of WMO number: 17605 and the Arminou DCP station no: 17603 at 34°52'N and 33°44'E . The Panagia station is located on the leeside and the Arminou station on the wind-side of the Troodos mountain range towardsthe southwest where there is more rainfall and higher flows. The proposed new stationis almost exactly on the other side of the Troodos mountainous range to that of the Panagia Bridge. All the stations are shown on the attached map. The new site is called GERMASOGEIA and it is on the Germasogeia River. The Germasogeia river basin is located in the southern flank of the Troodos mountain range draining to the sea at a point just 5 km east of the town of Limassol. It drains an area of 175 km2 that rises to elevations of 1,400 m above mean sea level. About 80 % of the basin consists of igneous rocks, diabase and pillow lavas, whilst the lower parts are of chalks, marly chalks and alluvium. The annual average precipitation over the catchment is 638 mm, varying from 450 mm near the coast to 850 mm in the uplands. The annual average runoff of Germasogeia River is estimated to be 22,5 million m3, 65 % of which occurs during the winter. The river is basically dry in the summer months. Within 5 km from the coast, a gravel aquifer develops with alluvium of sufficient thickness to render it of considerable local importance for ground water exploitation. An earthfill dam of 13,6 million m3 storage capacity was completed in 1969 cutting off completely the subsurface recharge to the downstream alluvium aquifer. The thickness of the alluvial deposits varies from 20 m near the dam to about 30 m just upstream of the very short delta fan near the coast. The width of the aquifer is about 250 m near the dam, expanding to 500 m just before the delta and up to 3 km wide on the delta. Only the upper part of the aquifer is used for abstraction because of urbanization of the delta. This aquifer had been relied upon for many years for local irrigation and for the water supply requirements of Limassol and neighbouring villages. At present, the aquifer depends exclusively on releases and on occasional spills from the reservoir for recharge since the dam has cut off any recharge through the subsurface, by a successful grout curtain. The aquifer acts now as a natural filtering medium for releasing reservoir water pumped for the water supply of Limassol and constitutes an additional storage that can be operated in conjunction with the dam. The present abstraction from the aquifer is used to meet 5,6 million m3/a of the domestic water requirements of Limassol and 2,5 million m3/a is used for the Germasogeia and other villages in the area. Only about 0,05 million m3/a is used for irrigation. The yield of the boreholes ranges from 80 to 150 m3/h. The permeability varies from 110 to 150 m/day whilst the specific yield is about 20 %. The storage capacity of the aquifer between the dam and the coastal delta has been estimated to be 6,5 million m3. 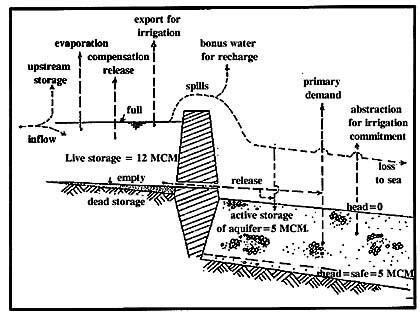 Provided that the aquifer is not full, it is considered that some 2,5 million m3/month could infiltrate and recharge the aquifer if the rate of release is uniform. Some 5 million m3 could thence be pumped from the aquifer out of its total storage. For a meaningful application of any conjunctive use, a good knowledge of the surface water available and of the operation of the aquifer is required. In the study case a rainfall-runoff model for the surface water evaluation and a ground water mathematical model for the aquifer have been calibrated and used. This DCP location has been chosen to be at the Germasogeia dam where for a number of years a conjunctive use project of surface water stored in the dam and ground water from the downstream aquifer has been under implementation. In the last 16 years, during which the conjunctive use is being implemented, the annual extraction from the aquifer increased from 4 to 9.1 million m3 whilst the artificial recharge varied from 2 to 8.8 million cubic meters per year. The rates of release are of the order of 15 to 25 thousand m3/d whilst the groundwater inflow to the main wellfield is in the range of 18 to 30 thousand m3/d. The Germasogeia system (reservoir and aquifer) although is at an easily accessible site is very intensely monitored due to the daily operation of the conjunctive use. Real time data are required for the successful operation of the conjunctive use. A slot for possible future water-meter signal (release from the reservoir) would be also desirable. These measurements will allow the evaluation of evaporation from the lake that will also be compared with the class A pan evaporimeter. Knowing the water level in the reservoir, which will also allow the evaluation of the spills, if any, and the water-table level in the monitoring well, will provide a complete monitoring of the conjunctive use operation. This application of the DCP will be of great interest to us and should as well be to the Med-Hycos. Details of the Germasogeia reservoir which will be completely monitored by the new DCP station are given in the attached Table 1 whilst monthly observed flows for the two tributaries flowing into the reservoir at this site as well as monthly rainfall are given in Tables 2 and 3. Photographs of the Germasogeia reservoir and related maps of the aquifer are shown on Figure 1 and 2.